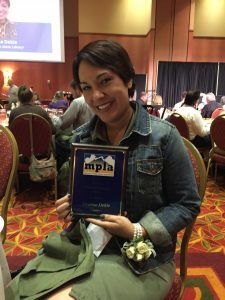 Deanne Dekle, NM State Library’s Youth Services Specialist Extraordinaire, received the Mountain Plains Innovator Award at the annual conference in Denver, CO on October 21, 2016, for her work with The Maker State initiative across New Mexico. Ms. Dekle has participated in many of the Maker State events at public and tribal libraries in the state and has helped tremendously in ensuring the success of the program. Though relatively new to the library profession, she has made the Maker State project into exactly what one is looking for in a library and STEM program — creative, inventive and trail-blazing. Many of our libraries that experienced the “Pop-Up” maker spaces have gone on to create permanent spaces for this activity in their facility. 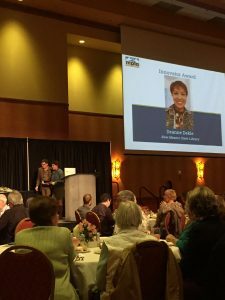 The State Library is very proud of Deanne and her work here in the Development Bureau as well as her work with public libraries throughout New Mexico.